Today's spotlight is going to be for a game that is just about to come out. It's a PlayStation 4 exclusive, at least so far. It may make its way to other platforms, but for now, if you want to play this, you'll need a PS4 to do it. 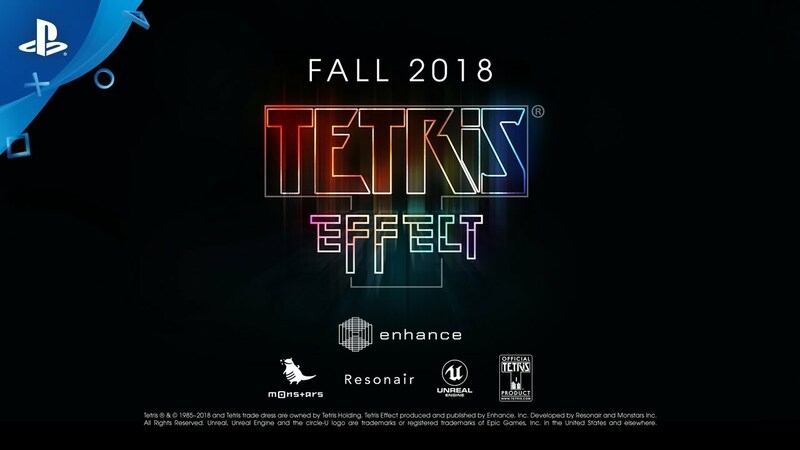 Today's game is Tetris Effect, releasing on Friday, the 9th of November, 2018. What's so special about Tetris Effect? It's just a regular Tetris game. Quite the contrary, in fact. This Tetris game is helmed by industry veteran Tetsuya Mizuguchi, known for sensory manipulating titles like Lumines and Rez. Tetris Effect takes the same sort of evolving presentation approach as Rez and applies it to Tetris. How does it work? Absolutely brilliantly. Each stage has its own unique feel, complete with animated backgrounds that respond to the music. Each stage's music and sound effects are also unique, and they build up as you progress through the game. It will start off as a sparse collection of sound effects, and then begin to layer musical elements upon each other, until you have a full-on song, some of them with very positive messages in their vocals. With how things are today, a little positivity in a game certainly doesn't hurt. The game also makes substantial use of the controller rumble function to provide tactile counterpoints to the audio and visuals. In other words, you've got a Tetris game that you can not only see and hear but feel as well. The effect is remarkably immersive, especially if you play the game with headphones. Tetris Effect's presentation is top-notch, there is no doubt about that, but if the Tetris gameplay isn't solid, then it's for naught. Fortunately, this is easily the most solid iteration of Tetris I have played in years. The pacing is as it should be, the control is responsive, and I never felt like I was having to fight the game. It was just so easy to get in and lose myself. It features two main modes, a "Journey" mode where you go from area to area completing line-clearing goals, and an "Effects" mode where you'll find the more traditional Tetris modes like Marathon or Sprint. There is also a player level system, as well as a set of Trophies to go after. Plus, there is an extensive set of options to tailor the game's look and feel. If you prefer traditional coloured blocks, you can have that. If you find the effects too flashy, you can tone things down. The game does a very good job of making sure you have the tools you need to play it the way you want to. There really is a remarkable amount of content in here. A new Zone mechanic has been added to the classic Tetris formula. As you play you'll build up a Zone meter. When that fills up you can pull the bottom triggers on the controller and go into a Zone mode. Here time stops and you can manipulate the playfield to set up lines or get yourself out of trouble. It's also the first time in any Tetris game where you can score more than 4 lines at once. 16 lines is the maximum, but I suspect I won't be managing that feat any time soon. It's a cool new mechanic and one that doesn't feel out of place, which is what I was worried about initially. One of the game's hallmark features is one that I haven't had a chance to experience yet, and I wish I could. Tetris Effect is a PlayStationVR title. Yes, Tetris in VR. I can only go by what people have told me so far, and every person I've talked to who's tried it says playing Tetris in VR is a mind-altering experience. I'll have to take their word for it, for now, though. And that's it for now. Despite it's $40 price tag, Tetris Effect feels like a game you can sink hundreds of hours into. It's nice to see this new, more modern take on the classic Tetris formula work. Tetris Effect is in the running for my Game of the Year, based on what I've played. I hope those of you with PS4 systems will give this one a look.